Like most cloud providers, AWS operates under a shared responsibility model. AWS takes care of security ‘of’ the cloud while AWS customers are responsible for security ‘in’ the cloud. 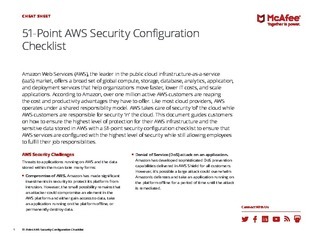 This document guides customers on how to ensure the highest level of protection for their AWS infrastructure and the sensitive data stored in AWS with a 51-point security configuration checklist. Read on for the top 51 best practices security experts recommend.